Patient presented aged 13 at the time of initial examination. Postural issues had been noticed 6 months earlier. 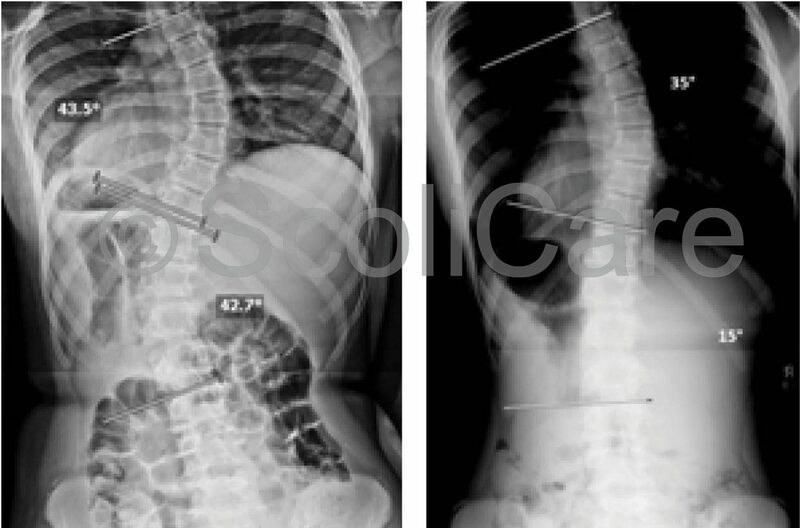 At the initial consultation the scoliosis curve measured 44° in the thoracic spine and 43° in the lumbar spine. Her pelvic growth plates were open and graded as Risser stage 1. 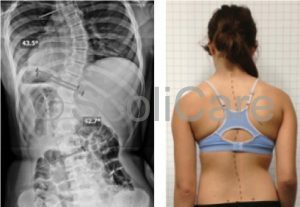 Adolescent Idiopathic Scoliosis was diagnosed. This patient had been recommended to undergo surgery. A combination of full time bracing using a customised 3D designed rigid brace and a daily home rehabilitation program, using a scoliosis treatment aid and Mirror Image exercises, was recommended. It was recommended to wear the brace for 23 hours per day and to use the treatment aid once per day for 20 minutes. This treatment regime was recommended for a minimum 24 months as the patient was immature and had substantial growth remaining. As can be seen from the photos, a cosmetic improvement in the body was seen within the first 3 months. This improvement was maintained at 12 and 18 months. At the 3 month mark an in-brace x-ray was taken showing very good correction of the curve. The thoracic curve reduced from 44 to 20 degrees and the lumbar curve reduced from 43 to 14 degrees (in the brace). At the 8 month mark an out-of-brace x-ray was taken at an independent radiology clinic, with the patient standing in her relaxed normal posture. This showed a significant improvement in the scoliosis curves. The lumbar curve was corrected by a staggering 28 degrees! The thoracic spine curve was corrected by 9°. The patient has continued with compliant treatment, and postural photographs at the 12 and 18 month mark show stability of the result. She is continuing with treatment. Xrays and posture photos from this case have shown that this combination of treatment has been able to improve the cosmetic look of the body, the spinal alignment and the degree of curve. 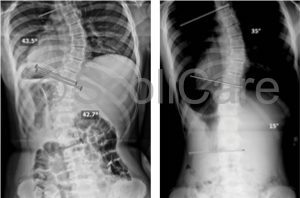 Although still immature and undergoing treatment, this case represents a positive initial result that will likely result in this patient avoiding spinal fusion surgery in the future. 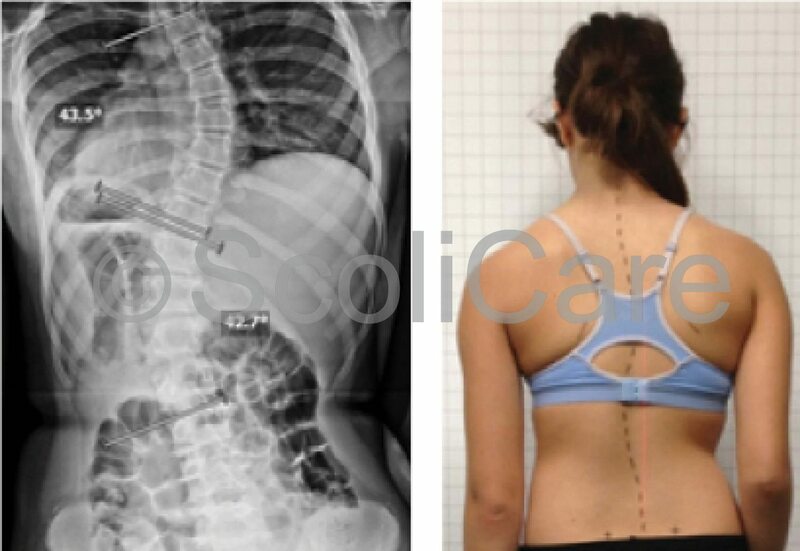 A rigid custom designed 3D scoliosis brace, in combination with a scoliosis specific exercise program, may achieve reduction in Cobb angle in similar cases. Choosing the right treatment with the aim of curve reduction and cosmetic improvement, are so far proving to be successful in this case.